Adjustable solid lifter conversion kit will correct all problems associated with hydraulic lifters and reduce valve train weight. Specially designed spring/lifter body insert will take up any slack resulting from heat expansion, eliminating the tick commonly associated with solid pushrods. 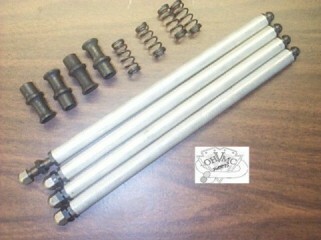 Fits Shovelheads with stock length cylinders 1966 - 84.